Get battery pricing information for your battery by entering your battery code in the field below and selecting your battery. 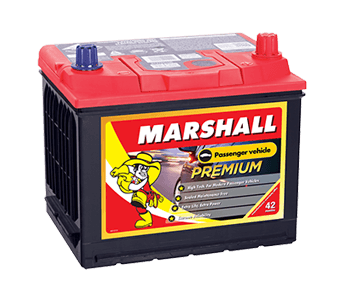 Find your nearest Marshall store right across Australia or Holler anytime on 1300 627 742 for your trusted battery specialist. Use the form below to find the right battery for your car, truck, 4WD or boat - in fact any type of battery across our huge range. Select an application below to see the full range of Marshall Batteries available, no matter what your budget or application. Do you need a New Car Battery? Marshall Batteries provides a superior roadside assistance service that painlessly gets you back on the road fast. For over 80 years, Marshall has been servicing Australians with a leading nationwide car battery replacement service. Our trusted mobile car battery replacement services for all vehicle types will have you up and running again in no time. The average price of a car battery depends on the size of the car and the quality of the particular battery. Cheap car batteries may seem like a good idea at the time but generally only last around 12 months due to their inferior materials and construction. Cheap car batteries may end up costing you a lot more. You may need to replace the battery sooner than if you went for a quality car battery. 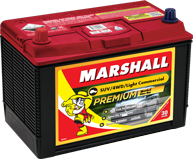 A good quality battery from Marshall Batteries should last 3+ years and come with our express nationwide warranty. For a good quality car battery to suit a small stop-start passenger vehicle, pricing starts at $149. Larger cars and SUV’s prices start around $160 including a 3-year nationwide warranty. Given the higher demand for SUV and 4WD vehicle types, a more heavy duty battery is required which results in slightly higher battery prices. With the upgrades of automotive technology, more recent model vehicles rely on more added requirements from their car batteries. With advanced battery monitoring systems, most modern cars will require a battery with silver calcium construction. If you are looking to find out which battery your model/vehicle type requires, you can use our battery selector. Where To Buy Car Batteries? There are a couple of options available to you to purchase your next car battery. Most Australians only think of their battery when it dies. 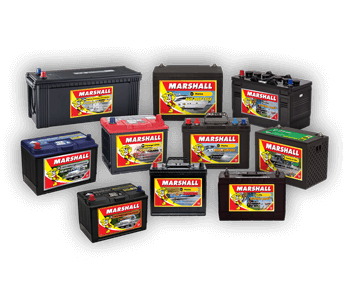 Marshall batteries are the most trusted company in Australia to get you back on the road fast. Marshall Batteries has been providing nationwide roadside assistance for over 80 years and leads the market in product and service. You might not know, we also provide roadside service for Boat Batteries, Truck Batteries, Truck Batteries, Start Stop Batteries and more. A convenient way to purchase batteries is through your local battery expert. Marshall Battery Experts will ensure you get the correct battery for your vehicle type. You can certainly purchase a car battery online, but this may not be the best solution. Without expert knowledge, you run the risk of buying the wrong battery for your vehicle/model type or fitting a battery wrongly that could cause problems with the vehicle. Marshall Batteries nationwide dealer network has been trusted since 1935 and can fit your next battery, day or night. To see the latest car battery prices, you can request a quote online, or visit your local Marshall Dealer Locations. We can provide you with everything you need to know when buying a new car battery for your vehicle. The starter motor, ignition system, and fuel system are all operated through the stored electrical energy within the battery. The alternator supplies the electricity needed to keep the engine running, along with all of the vehicle’s systems. It also charges the battery to replace the energy used to start the car initially. Marshall is committed to ensuring that you have a reliable car battery to maintain the performance of your vehicle. You can view our quality range of batteries online. Each of our available products is manufactured with reliability and quality in mind, providing you with the comfort that you will be able to get where you need to be. How often do you drive, and how far are you driving each time you commute by car? During short trips, your alternator may not be getting enough time to charge your main electrical energy storage. Meaning that your battery is at a higher risk of running out of power. Choosing the right battery for your use is imperative, and Marshall prides itself on providing the best battery solution. Was your battery installed correctly? With the ongoing development in the automotive industry, batteries have become more technical. This means that the task of replacing or installing a battery is no longer as simple as it once was. You may require the expertise of a battery specialist, with access to the latest tools and equipment. If you are unsure about the installation process, be sure to Holler for a Marshall. Our team of battery installation specialists have extensive training in working with a wide variety of battery types and vehicles. Incorrect installation could result in the disruption of other systems that rely on electricity to operate within your car. These electrical systems may include your radio, air-conditioner and lights. Damage to your car’s various electrical components resulting in potentially costly repairs. Temperature can affect the way in which the chemical reaction within your car battery occurs. Extreme heat speeds up the chemical reaction shortening the battery life. Extreme cold can sometimes prolong battery life by slowing down the reaction. An insulating sleeve covers most modern batteries with the aim of protecting the battery from extreme climates. When Do You Need To Replace Your Car Battery? After several attempts to start your car, this may be a key indicator that it is time to consider replacing your battery. A new battery has a specified capacity to provide power. This is referred to as the cranking amps rating of the battery. As a battery ages, the actual amps that a battery can supply becomes lower than its original rating. Once the cranking amps fall below a critical threshold, it will be difficult or impossible to start your car. If you see your warning lights illuminated, it is an indication that something may not be right. You should get a car battery replacement specialist to test your battery and determine the best solution for your vehicle. If electrical systems are inactive, it is worth getting the assistance of a battery expert to test your car battery. How Quickly Can Marshall Replace Car Batteries? Marshall Car Battery Replacement Services will attend to your vehicle and test your car battery. If it is necessary to replace your car battery, Marshall can have you back on the road, usually within an hour. One of the major perks that come with Marshall Batteries 24 hours Roadside Assistance is that you don’t have to pay membership costs. Marshall will be there for you when you need. Battery Breakdowns can occur in any place, at any time. 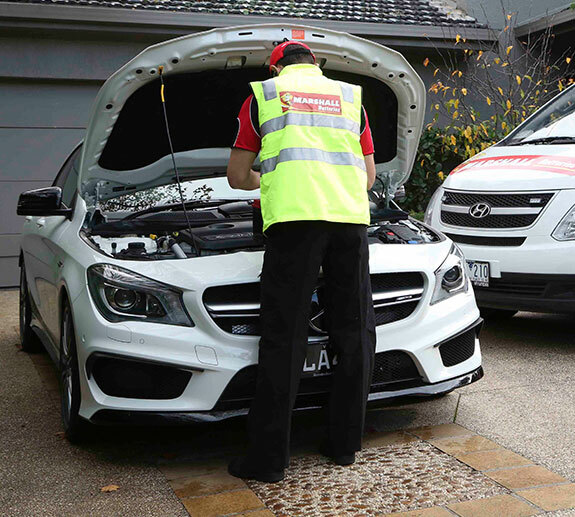 Our team of battery specialists are committed to providing a leading national roadside assistance service 7 days a week. Our 24/7 roadside assistance is available in all metropolitan cities and most regional areas across Australia. Why You Should Avoid Cheap Car Batteries? It can be tempting to look for the lowest car battery prices on the market. This can be an expensive mistake, as a car battery is one product that needs to constructed with the right materials to ensure reliability and performance. Marshall makes it an absolute priority to ensure that each of our wide range of batteries meets the strictest quality standards. All our batteries meet OEM standards or greater. What Should I Consider When Buying A New Car Battery? Ensuring you that your battery is suitable for the dimensions of your vehicle’s battery tray is important. It helps to ensure that there is minimal damage arising from vibrations. Which is why having the right battery length, width and height is essential. Refer to your owner’s manual or find out with the assistance of our online battery selector. Alternatively, Holler for a Marshall on 1300 627 742, and we can assist you. The reserve capacity is the amount of time that a battery can run on its own power storage. This includes running without the engine, and before discharge. A car with a higher reserve capacity can withstand tough conditions such as alternator failure. A non-compliant engine or if someone has accidentally left the lights on, which is something that can happen to anyone. Are you opting for a low maintenance battery or a maintenance-free battery? Maintenance-free batteries are usually pre-sealed and they do not require replacement of liquid. Low maintenance battery is unsealed, and have caps that allow you to add distilled water when needed. Do Marshall’s Car Batteries Come With A Warranty? Each of Marshall’s car batteries come with a nationwide roadside warranty of up to 42 months*. You can rest assured that your car battery will be reliable to get you where you need to be. Find the right battery for your car online today. 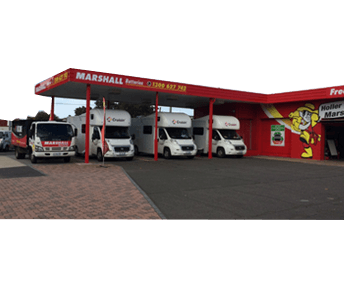 In Australia, Marshall Batteries has associations with large scale private and commercial fleets. We provide battery replacement services to fleets such as Leaseplan, GE Custom Fleet, Orix, National Truck Insurance, Motorpass, Motorcharge, Caltex, NLC, Smart Leasing, Telstra Fleet and many more. If you require battery assistance for your fleet, we can assist you via our nationwide services. Alternatively, you can refer to your providers authorization for further instructions. For more assistance and information regarding our Fleet Service Programs, be sure to get in touch with us, and we will connect you to our Marshall Fleet Manager to go through the service in greater context. We can provide your medium to large scale fleet with a leading battery replacement service. Breakdown situations can occur at any time. 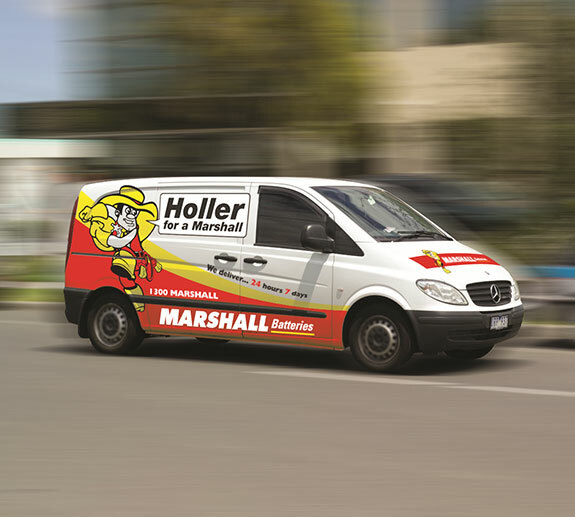 If you get caught with a flat battery, have locked your keys in the car or your vehicle runs out of fuel, simply 'Holler for a Marshall', your trusted local emergency roadside assistance expert. Phone 1300 627 742 day or night. Marshall Batteries has no annual membership fees or annoying roadside joining fees that make your breakdown experience even worse. Did you know that Roadside Assistance membership does not include the cost of a battery? 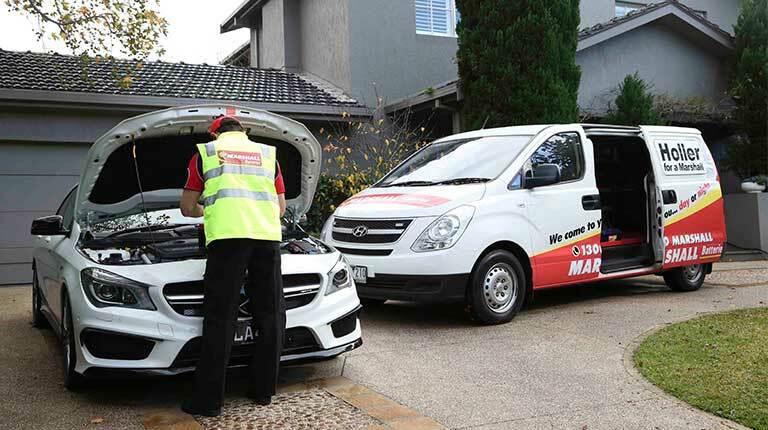 Roadside Assistance providers charge you for the battery so don’t settle for second best, choose Marshall, Australia’s trusted battery specialist in Melbourne, Sydney, Brisbane, Hobart, Adelaide, Darwin and Perth. 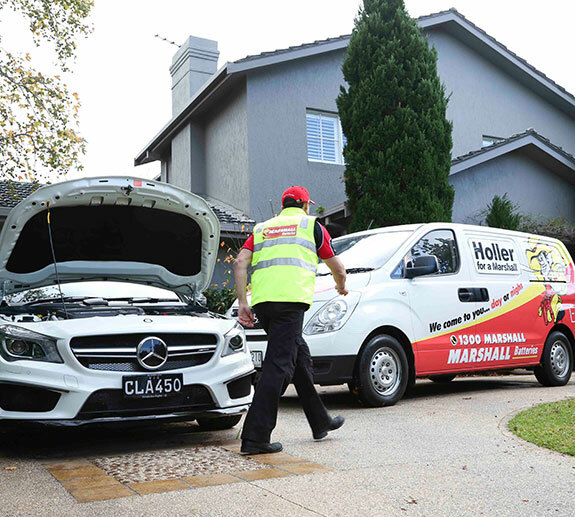 Anyone can Holler for a Marshall day or night- Our Roadside Rescue services are available in all states of Australia and we offer a nationwide roadside battery extended warranty. 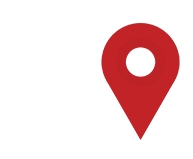 We are in the greater metropolitan areas of Adelaide, Brisbane, Canberra, Melbourne, Hobart, Launceston, Darwin & Sydney and right across Australia. 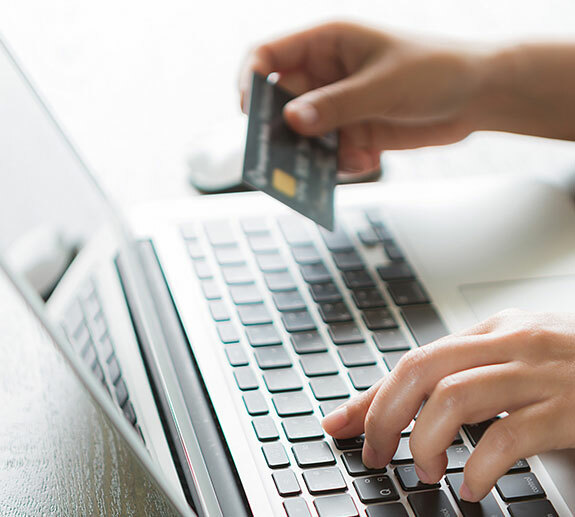 With no joining fee and no waiting period, its pay only when you need the service, putting you financially in front with a quality product and trusted service. Real value is a longer lasting, quality batteries designed for the rigors of Australia. 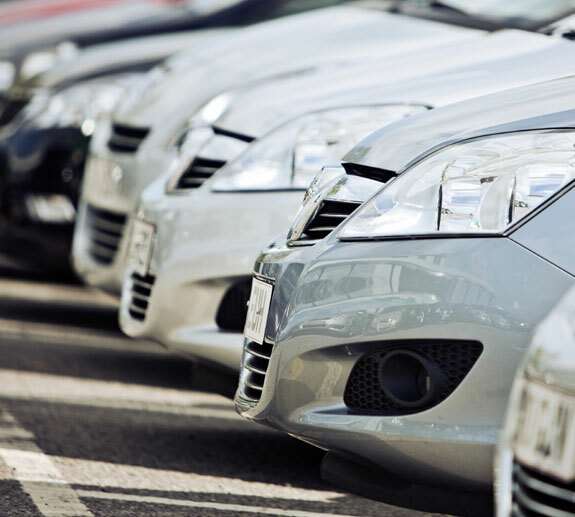 We also provide Fleet Services for cost effective maintenance for your car, truck or van fleets. Choose a trusted Marshall battery with superior performance and receive an extended nationwide roadside warranty, to look after you right across Australia. Help us protect the environment by recycling spent and used batteries and returning them to one of our Battery Collection Centres or call us on 1300 627 742 to arrange the safe recycling of your old battery.